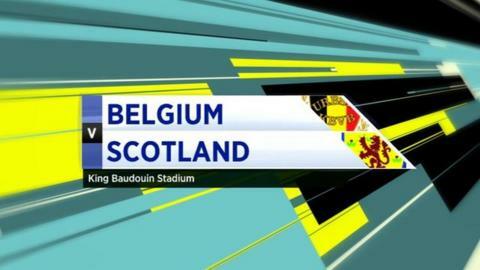 Scotland's chances of reaching the next World Cup were all but ended in Brussels as Belgium underlined their status as one of the most exciting sides in Europe. Scottish resistance was broken on 69 minutes when Christian Benteke powered in a close-range header. And skipper Vincent Kompany hammered in a fierce shot soon after. Craig Levein will now face questions about his future, with the Scots having amassed two points from four matches. The match was widely billed as Levein's last stand, with the under-fire coach admitting a victory was necessary after failing to win a game in what was just about the gentlest opening to World Cup qualification possible. The enormity of the task facing the Scots was underlined when it was revealed the in-form hosts could afford to leave Chelsea's £30m star Eden Hazard on the bench. With Axel Witsel, who has an even higher price tag, running the show in the middle of the park, Belgium started like an express train and Allan McGregor had made a string of fabulous saves inside a breathless first 15 minutes. The Besiktas keeper made an astonishing double stop to deny Dries Mertens and continued to repel wave after wave of attacks from the men in red. Galloping full-back Jan Vertonghen shot over from a tight angle and Nacer Chadli could not force the ball in from close range after a rare misjudgement from McGregor had allowed a Kevin De Bruyne cross to reach the back post. With Darren Fletcher and James McArthur being over-run in the middle of the park, James Morrison had to drop deeper to offer support, meaning Scotland striker Steven Fletcher was an isolated figure. But the visitors did threaten from a long-range Shaun Maloney free-kick that was tipped away by the giant Thibaut Courtois. Belgium responded swiftly, with Moussa Dembele and Mertens both shooting narrowly wide, while Benteke headed over and Danny Fox made a crucial tackle to thwart Chadli on the six-yard line. During that late first-half onslaught on McGregor's goal, Kris Commons had Courtois at full-stretch again to push away another good Scottish free-kick as the visitors mounted a rare attack. Hazard was introduced for the second half and fizzed in a shot that was blocked by Gary Caldwell in front of McGregor, shortly after Benteke had skimmed the crossbar with a header. Hazard curled a free-kick wide as the home crowd started to grow a little nervous about the stalemate. However, two goals inside three minutes had the noise levels cranked right up again and buried Scotland's chances of taking anything from the match. McGregor pushed away an awkward shot from De Bruyne but could do nothing as the same player found Benteke at the back post with a lovely cross and the Aston Villa striker nodded home powerfully. Kompany was then given far too much room to turn and blaze a shot high into the net from 15 yards. McGregor had no time to feel sorry for himself as he got down to smother another Hazard strike and the Chelsea man thumped a free-kick over as Scotland failed to make any kind of dent in the home defence. Scotland are now bottom of Group A after four matches, with the visit of Wales in March up next and a mountain to climb if any pride is to be salvaged from the campaign.